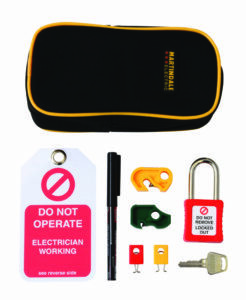 Wholesalers are ideally placed to offer a complete electrical safety solution, whether it’s a quick fix for an electrician who is on-site and does not have the right locking off device, or for maintenance teams who need complete test kits that will keep them safe wherever they are working, says Martindale Electric. Implementing safe isolation procedures is essential to achieve compliance with the Electricity at Work Regulations, which are there to ensure workers on-site are not exposed to danger when working on or near electrical systems. With around 1,000 serious accidents in the workplace each year and 16% of all fatalities linked to electricity, it is clear how important it is for contractors to follow simple safe isolation procedures and to use the correct equipment to keep safe and avoid heavy penalties of up to £10m for non compliance. Although electricians are trained in safe isolation procedures, there are still many maintenance and installation teams who are unaware of what they should be doing to stay safe and what equipment is required. Ensuring the right tools are available for the job might seem like common sense, but it’s often neglected, putting lives at risk when working on electrical installations and equipment. So firstly, let’s look at what is needed for safe isolation. With such a wide range of equipment available, the choice of product can often be overwhelming. However, the essential equipment needed to stay safe and achieve compliance with the regulations are locking off devices with unique keys and a clear method of labelling the hazard, a dedicated voltage indicator and a proving unit to verify the voltage indication. However, locking off the circuit correctly is just one part of the procedure. Before carrying out any work on the circuit, you must prove the circuit is dead with a dedicated voltage indicator and a proving unit as circuits are frequently mislabelled so there is no certainty that the correct circuit is locked off. With a wide range of voltage detectors and indicators available, it is important to understand why some equipment, such as multimeters and non-contact voltage detectors, should not be used for this process. Multimeters are not suitable as it is all too easy to select the wrong range. In addition, multimeters rely on battery power to function, so it is possible to make a false “dead” reading on a live circuit if the batteries are flat. While non- contact voltage detectors are frequently used to detect live cables, they cannot reliably be used to prove dead. The list of suitable voltage indicators includes testers, such as the VI13800 or VI-15000, or test lamps, such as the Drummond MTL10 or MTL20 from Martindale Electric. Martindale voltage indicators for safe isolation are fully compliant with the latest standards and are designed for safety, with no batteries or switches which could lead to false indication. In compliance with guidance, the recommended procedure for proving dead is to check the voltage indicator against a known source such as a proving unit, then test the circuit, then test the voltage indicator against the known source again to prove the tester has not failed during the testing procedure. Whilst a known live source can be used to test the voltage indicator, it is recommended that a dedicated proving unit matched to the voltage indicator is used. This will ensure that all LEDs on all ranges are working. In many cases, an alternative known live source may not be available on-site and it could be hazardous connecting to it. In order to get the job done quickly and effectively, many customers are now turning to safe isolation kits, which include all the necessary equipment to prove dead and lock out the circuit being worked on. Good examples of this being the Martindale VIPDLOK138 and VIPDLOKPRO138 which include the industry standard voltage indicator, proving unit, locking off devices and combination carry case. Widely specified by contractors and maintenance teams, kits offer an all in one solution, are easy to use and ensure compliance with Health and Safety Regulations. With such a vast range of test equipment available, arguably the most important factor for the wholesaler is to be able to provide an all in one solution from a trusted brand. Cost is another factor that needs to be taken into consideration. However, as tempting as it might be for a customer to buy a cheap tool, which simply “does the job” when it comes to electrical safety, purchasing decisions are more often than not based on industry recommendations, reliability and trust. In short, good quality tools deliver volume sales and repeat business and profitability. Stocking Martindale Electric tools won’t just drive profit but most importantly, it keeps customers safe and compliant with the latest Health and Safety standards.